Today it’s time to Celebrate your own Birthday by giving some exciting gifts on your own nails. 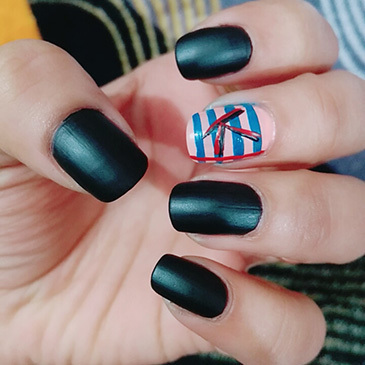 Let’s make this elegant Birthday Nail designs easy for you with the help of this step by step tutorial. I hope this Steps will help you to enhance your normal nails appearance more attractive & beautiful. For beginners, it’s a very right tutorial to explore because you can create the same design with the help of pictures. I started with the base coat on my nails that prevent yellow stain on my nail pallets. Leave it for 5 minutes so that base coat gets dry meanwhile you can jot down your nail polishes. 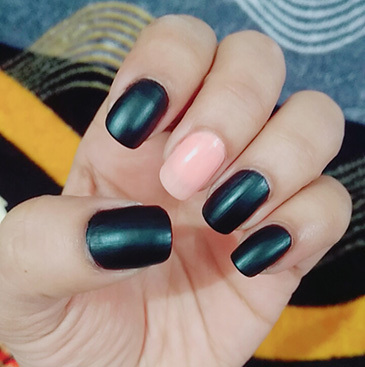 Now it’s time to give a beautiful colorful base for nail art design, let’s start with Matte Black and peach colour nail polish for a base. I applied Matte Black colour nail paint on my nails except on my middle finger. For middle fingernail, I choose some light colour to make nail art design more engaging. 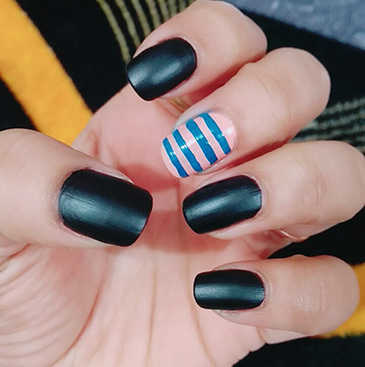 To make Birthday Nails art more elegance, here I have drawn detailed horizontal stripes of Blue colour with the help of liner Brush only on the middle fingernail. I know for a beginner its difficult to draw such straight lines. Here I would love to tell that you can use scotch tape to get such straight blue lines. Let me tell you guys how? Cut the tape into multiple pieces and tapped it one by one on your nail, now apply blue nail paint over your middle fingernail. With the help of Tweezer remove tape one by one, you will see the same stripes as I drawn with the liner brush. Selected pastel Red and Black nail paint colour to highlight the design. 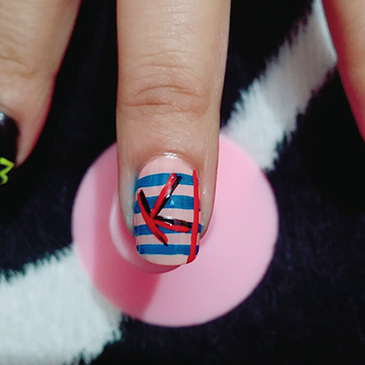 Here I have used the liner brush to draw letter “K” on my middle fingernail. 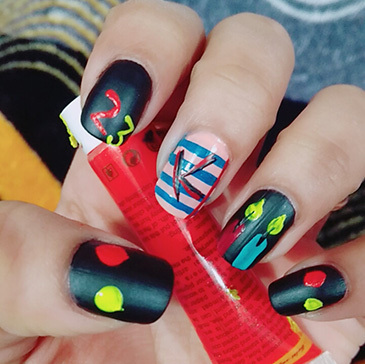 Nothing to worry if you have never done nail art like this before I suggest you to practice it on a sheet of paper. This will help you get a better result when drawing on your own nails and also make sure to choose some pastel colour to give a beautiful contrast. Now moving onto the ring finger, I selected pastel Red and Green colour for drawing beautiful candles. To give proper shape I have used a striper brush for the body of the candle, with the help of liner brush I have filled the uneven patches. Now with the help of liner brush make the middle zoon with pastel black colour, to give a complete look of candle make use of yellow pastel to draw flame. I have made use of my pastel yellow and Red colour paint, to make Happy birthday nails more interesting. 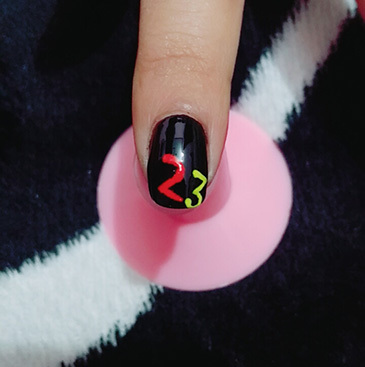 Here I have made the best use of my thin pointed detailer brush to create this “23” digital number on my Birthday Nails. 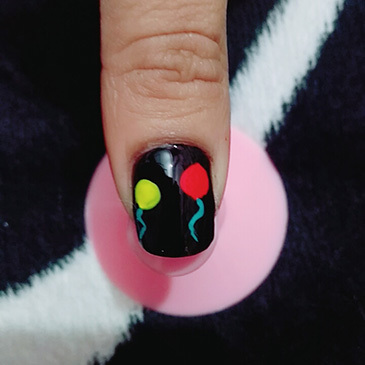 Now all left is the balloons to make nail art more funky and stylish. You can make the balloon of any shape you like the most it can be round, oval or heart shape. But here I have drawn round balloons. Firstly give a simple outline with the help of a dotting tool and then filled the empty space with the help of a detailer brush. For a complete birthday, nail designs look, I have used the liner brush to make a string of balloon in a zig-zag shape. Let’s seal the nail art design with the help of top coat as it will keep the design last longer.